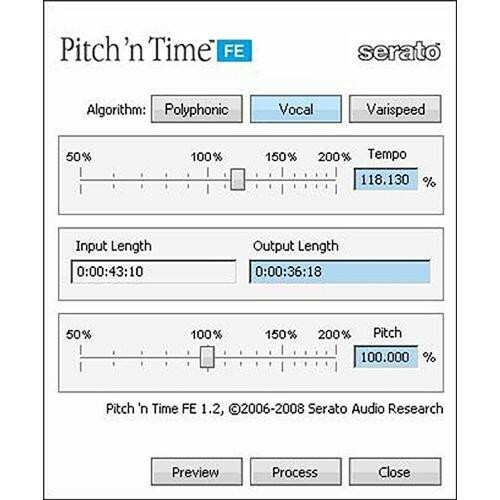 Pitch 'n Time FE from Serato is a time and pitch adjustment plug-in that uses a patented time compression/expansion and pitch-shifting algorithm for glitch-free processing. Traditionally pitch/time manipulating application used math to either remove or add samples, or change sample rates to achieve the desired result. Some program material responded well to this treatment, while for other material, distortion or other artifacts would be introduced rendering the processed files useless. To this end, Serato Audio Research developed a sophisticated model of the human auditory system and in a sense, the software "listens" to the music, performing a sophisticated auditory scene analysis and deciding how best to treat the source material. Dramatic alterations can be made to a sample, or even to a completed mix, and the result is a natural sounding product, with the output sound the same as the input. Pitch 'n Time FE is designed for use with Fairlight's CC-1 powered Dream II family, including Xynergi, Connie, Satellite AV, Station Plus, Constellation XT and Anthem systems.